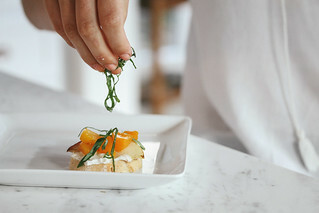 Crostini is an Italian appetizer consisting of a small slice of grilled or toasted bread and toppings. 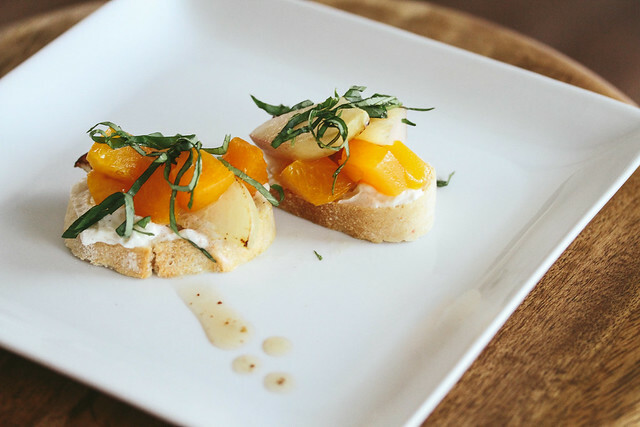 Crostini, a fancy Italian word for ‘little toasts’, are the perfect solution to any party appetizer. In my book, there are no rules for a crostini except a slice of bread (your choice, although baguette is customary) and whatever suits your mood for the topping. 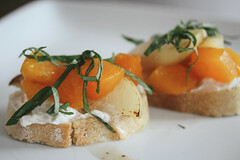 I am moving into the swing of summer, so I concocted an apricot, peach, basil, goat cheese crostini. The vibrant colors of green, orange, and white make it stand-out appetizer (I am thinking of serving it during the our World Cup Watch party as a tribute to the colors of COTE D’IVORE (the Ivory Coast, although I don’t actually know what their odds are…). 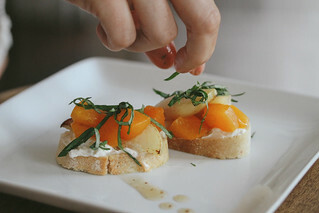 Cut the apricot, Orange Flesh peach into ½ inch cubes. Slice the white flesh peach into large pieces for presentation. Add your cubed stone-fruit and sauté for 3 minutes. 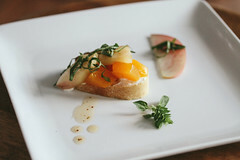 Remove from pan, but do not wipe clean, since you can use it to quickly sear the sliced white peaches for presentation. Heat to Medium High and cook peach slices for 30 seconds. Flip the peaches and repeat on the other side. Now onto the Whipped Goat Cheese, using an electric mix or food processor. 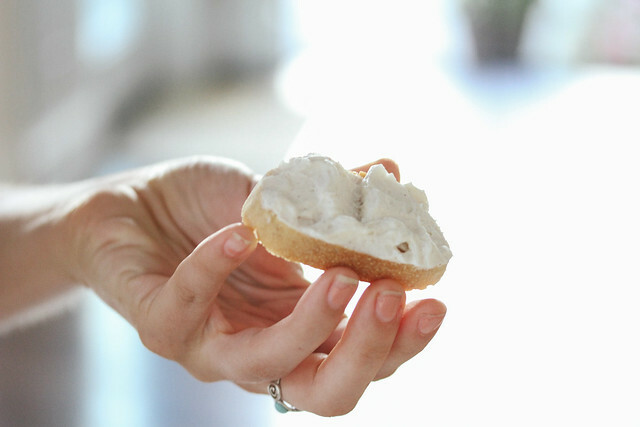 Blend Goat Cheese, Cream Cheese, and Heaving Whipping Cream until integrated and smooth. Chiffonade your basil to top your crostini. Slice your bread (1/2 inch), top with a little olive oil, and toast in the oven browned and slightly crispy. Now just assemble. 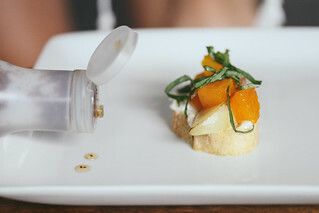 Spread your whipped goat cheese, top with cubed apricots and peaches. Now add the final touches of the white flesh peach and Basil. And for a last touch, you can drizzle with balsamic reduction if on hand.